Awww, everyone has such happy faces! How fun for you to be riding again. You look GREAT in your helmet by the way. Those two are so cute in their "corral." Little rascals. Hi Lisa, Looks like you had a beautiful day to ride. That's a great photo of you and Phoenix. 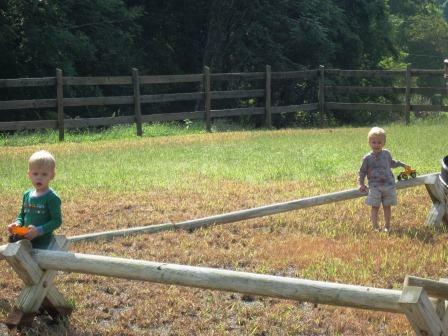 The twins seem really happy in their corral! I remember seeing the frisbee courses at a nearby park and being amazed at the skill of some of the players. Hope you have a fun day. What great pictures!! 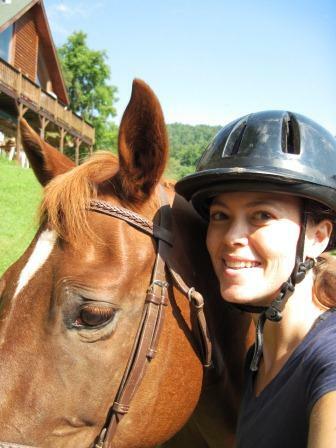 Glad you're back in the saddle again, I look forward to more horse adventures. 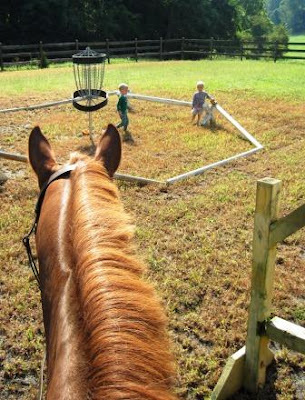 I remember the days of little kids and trying to manage some horse time. I always had the barn right outside the house... and I remember a few times bringing the baby monitor out so that I could ride while someone was napping in a crip or playpen inside. Your way is smarter, you've got your eyes on them. Love the kid corral. Nice story, you figured out a way to ride and at the same time watch the kids, good thinking! You are so smart! I'm thrilled you're back in the saddle again. Phoenix is a real beauty...and so are you. Can imagine that it feels great to be back in the saddle again :) Great pictures. Enjoy your day! How cute. They have their own corral. How fun! Bet they were excited! How wonderful for you! I haven't been riding in ages, but I have taken my 4 year old out to ride the horse I grew up with a couple of times. Fun! Fun shots, I enjoy the twin corral.I love to ride and get it in as often as I can. Great idea!! Hope the boys are happy being out there when Mama rides. I'll be they are! i am soooo happy for you lisa!! 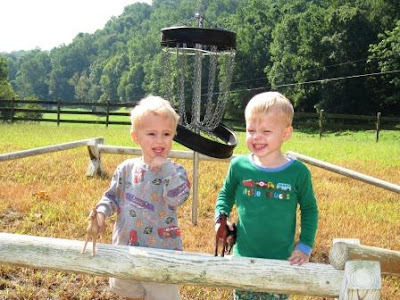 what a great idea and the twins look very happy!! a wonderful read to hear of you saving phoenix and having him for all these years. and a beautiful picture of the two of you, you look great, phoenix too!! That's great! Where there's a will there's a way! I'd choose riding over frisbee golf, too. I am so happy that you were able to get a little riding in. That's wonderful!!!!! Clever idea! I'm glad you were able to get some riding in, and I'm even more glad that you rescued such a wonderful horse! And great picture of you, by the way! Good for you! I totally know what you mean about the riding - its so hard when the kids are small. And its easy to get sucked into the list of chores rather than the fun riding time. Your Pheonix reminds me so much of my Sam who I miss so much - thanks for sharing. I have a new horse I bought a year ago when I finally felt like I was ready to get back my me time and its still really hard to find that time. Stick with it - you all look very happy! YAY! That's great that you can ride once again. I have had a hard time getting artwork done since my boys have been born. My husband gets more done than I do. I do use some creativity with blogging. Then I put a lot into holiday cards for people. Sometimes I manage to get a painting, rework furniture and other things creative done. Plus I'm a college art instructor; I talk about creative ideas much of the time. I feel like I give some of my good ideas away to the students though. I'm so glad you'll be able to ride more. I love the corral for the twins, and they seem very happy! Isn't there a song, Back In The Saddle Again? Yay for you!! Gotta do it while you're young and still can. That's a beautiful photo of you and Phoenix! So glad you got to ride. 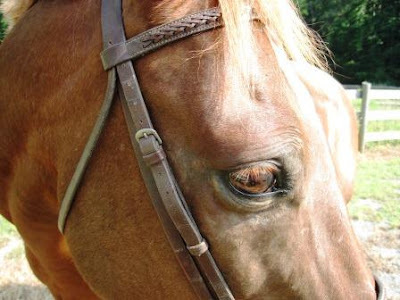 If they boys keep playing so well with their horse, it sounds like you will get to ride often. They look happy with your solution. I have not been able to ride in years. I am glad you found the time to ride again it is important to enjoy the little things in life. Yay!! I'm SO GLAD you came up with a solution, because you know the benefits of riding . . . and your boys get some playtime in the fresh air! Happy trails! and Happy twins! The boys seem to be enjoying their situation! Nice to see that you are getting some time to enjoy your hobby. That is important as a mom! Yay for you Lisa!!!! I loved the "coral for the twins, not the horses"...or whatever you said... hahahaha. Good for you that you did it and I won't tell anyone that your twins were in their pj's. Just so you got to do what you love finally. ooops, pardon. I am a city slicker and didn't spell "corral" right. I am afraid of horses. I champion those that are not afraid. So go for it!!!!!!!!!! Lisa...you crack me up! You built a corral for your twins...lol. Actually, a good idea. Glad it worked out and you can get back to riding again. Good for you! So glad to hear you're riding again. Keep it up...but be safe! Love the corral for the boys :) So glad you found a way to get outside and ride your horse! Phoenix looks beautiful. I love the last picture! I'm so glad you got a chance to ride again. You know that I have the same problem!